As we head towards the Fall season, I thought it would be a great time to introduce some NEW staple pieces of jewelry that compliment any wardrobe. Classic Black. It's always a great match for nearly every wardrobe and it never goes out of style. This classic color may not be reported as a "trend" for Fall 2008 by those in the fashion world, but it is a color that can be worn any season of the year. To assist you in accessorizing your favorite outfit this coming fall season, new beaded jewelry pieces are beginning to be added to the Crystal Allure Creations collection that will include black onyx, tourmalinated quartz, both jet and black diamonds Swarovski Crystals. The classic black handmade beaded watch above features tourmalinated quartz gemstones, complemented by white twist Swarovski Pearls and sterling silver. The beautiful gemstones in this design are a milky white quartz with striking black needle-like inclusions (rutiles) of black tourmaline. 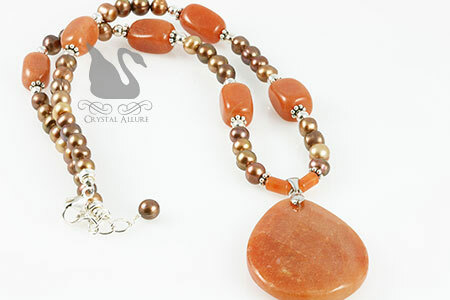 You can already see some of the new beaded jewelry pieces on the Crystal Allure Jewelry website. More classic black designs will be added in the coming weeks and then even more new beaded designs will be added mid-September featuring Fall 2008 color and jewelry trends. Remember -there is always something new at Crystal Allure Handcrafted Beaded Jewelry! If you are looking to drive traffic to your handcrafted jewelry / handmade jewelry website, then you should take a moment and check out the Handcrafted Jewelry Top 100 jewelry directory site. What is the Handcrafted Jewelry Top 100? It is an online jewelry directory where you can browse and find artisan jewelry sites featuring unique handcrafted jewelry and original lampwork beads and jewelry by some of the finest artisan jewelry designers, handcrafted jewelry artists and lampwork glass artists around the web. What is so great about the Handcrafted Jewelry Top 100 directory is that it only hosts website links to artisans -no commercial sites are allowed to join. What that means for the consumer is, no matter what site they choose to browse, the items they purchase have been handmade and not mass-produced. For the website owner, you receive "free" advertising that increases traffic that may generate more sales for you. This directory is for you, if you are a handmade jewelry artist or lampwork artisan interested in driving traffic to your site. You can register for FREE just by opening an account and entering your website data and banner (for visitors to see and click over to your site). The only requirement is that you place a Handcrafted Jewelry Top 100 banner on your site (the banner and link information will be provided to you when you register). If you choose this option and would like your banner to be visible, you must be listed in the top 100 sites. If you are not listed in the top 100, you can get there by promoting the Handcrafted Jewelry Top 100 banner on your site, in a prominent place, for visitors to click over to the site (each visitor that clicks over gives your banner listing 1 vote -the more votes -the higher in the list your banner will be). 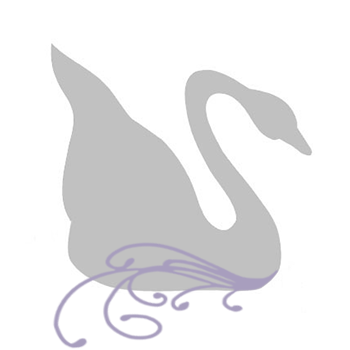 If you have questions about becoming a member or how to register, please feel free to contact the list administrator through Crystal Allure Beaded Jewelry. Not that I thought it wouldn't happen at some point but, geeze! 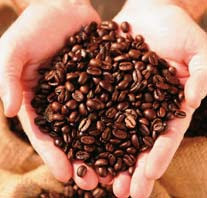 Coffee too?! I love my afternoon coffee, but not anymore. Today, I went to get my regular afternoon coffee from my favorite coffee vendor (and no, it's not the place you're probably thinking of). Anyhow, the woman cashing me out just blatantly shouts the new price and I'm taken back -$4.54?!?!? Are you kidding me? So, today is a sad day...Now I'll have to bring in my own creamer from home just to have a decent afternoon cup of coffee. Okay, rant is over. On to the really important part of this blog post. Ask any of my friends and they'll tell you the same thing. If the crowd all shuffles left -I'm going right. I like to be different, that's just my thing. So, beginning August 15th you will find some great savings on handmade beaded jewelry from Crystal Allure Designs! A great sale for handcrafted jewelry -love it more! One of my favorite bracelet series is the Friendship Series. It showcases a sophisticated collection of charm bracelets inspired by what else -Friends! Myself, along with three other friends, try to get together periodically for a "ladies night". This gathering usually involves relaxing with the ladies, great conversation and a few tasty cocktails. Friends are an important part of our lives and the Friendship Series of bracelets celebrates the bond of friendship, the sharing of our hopes and dreams and the laughter of fond memories of a girls nights out. 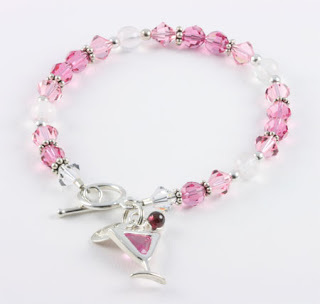 The Friendship Series currently has available the Margarita & Cosmopolitan (shown below) charm bracelets. Pick one up for yourself or your friend! If you need a special size, please email me prior to ordering. If you are interested in a group of Friendship Series bracelets, either custom designed or a re-creation of the charm bracelets available, please contact me to discuss the details. As part of Feature Friday, enjoy FREE SHIPPING from now through Sunday, August 10th. 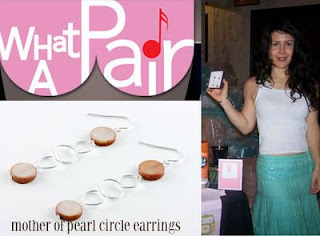 Pictured below is Lili Haydn with our exclusively designed Mother of Pearl Circle Earrings. These earrings were designed just for the What A Pair Celebrity Duet Event that took place in June. I was very happy to see our earrings displayed front and center on the celebrity gift bag table all day (and in every photo!). And for those lucky few Crystal Allure VIP newsletter subscribers who purchased them during our limited time offer -you now own the very design gracing some of our favorite celebrities! Remember, if you're not already a newsletter subscriber you can sign up today for future exclusive VIP offers like this one. Just use the sign up box in the right hand column. The past weekend proved to be very productive and you will find posted on the website many new beaded watches and bead pendants. While sitting in front of my "bead pile" I realized I had just one lampwork or gemstone bead left over from a previous design and I thought it would be a waste not to do something with it. I had designed a few pendants in the past but focused on building my regular line. But the timing was right, the beads were at hand and viola' -new chic beaded pendants! 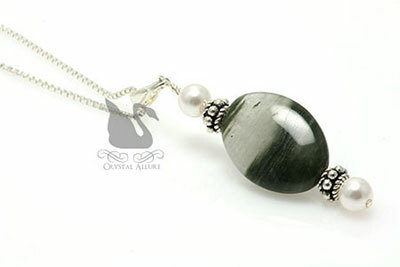 A beautiful naturally banded oval moss agate gemstone bead is paired with sterling silver Bali, white Swarovski Pearls and draped on an elegant 18" sterling silver chain. Length of pendant measures 1-3/4". 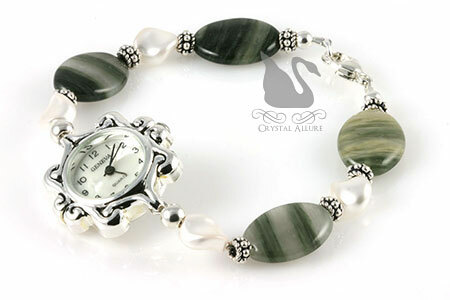 Handcrafted beaded watch features naturally banded moss agate gemstones, white Swarovski Pearls, .925 Bali and sterling silver. Elegant swirled silver mother of pearl geneva quartz watch face, stainless steel back, water resistant. 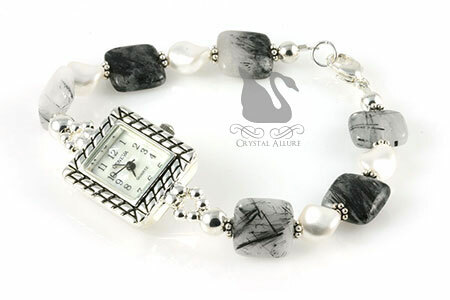 Watch bracelet measures 8-1/4". You will also see I finally figured out how to take better photos! 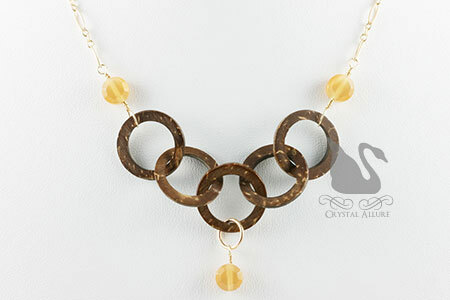 *smiles* So over the next few weeks, I'll also be getting better, crisper jewelry photos posted too.